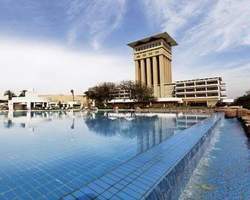 Movenpick Elephantine Island Hotel Aswan and Spa, a beautifully landscaped island on the River Nile, provides a tranquil environment, exquisite scenery, and services and facilities to please even the most discerning guest. Standard Room with a king-size or 2 single beds, 32 sqm with Nile view. Room can accommodate a maximum of 2 adults and 1 child in existing bedding. Extra bed at a charge is possible. Superior Room with 1 king or two twin beds, 38 sqm or 32 sqm, overlooking the Nile. Room can accommodate a maximum of 2 adults and 2 children in existing bedding. Extra bed at a charge is possible. Junior Suite duplex level, king or twin beds, living room, Nile view, ground floor. Family Suite duplex level, 2 bedrooms with 1 king bed and 2 single beds, living room, Nile view. Room can accommodate a maximum of 4 adults and 2 children in existing bedding. Extra bed at a charge is not possible. Well-equipped two bedroom villa with king or twin beds. Facilities include two large bathrooms, dressing room, living room and balcony overlooking the river Nile. Room can accommodate a maximum of 4 adults and 2 children in existing bedding. Extra bed at a charge is possible. The Orangerie, with views over the pool and gardens, offers the famous Mövenpick buffet for breakfast, lunch and dinner. If you prefer, you can choose from our à la carte selection of local and international dishes. Open 24 hours daily. Choose light à la carte dishes and snacks from Movenpick Resort daily changing menus. Enjoy refreshing drinks and cocktails and Movenpick Resort famous Mövenpick ice cream in relaxing surroundings beside the pool. Featuring a large terrace, the Grand Ballroom can be divided into three equal parts. Audio-visual equipment, controlled by programmable wireless touch screens, 360-degree ceiling camera; colour monitor. Offering massages and a therapeutic sandpit, table tennis and a pool billard table.